Late last year I visited Sri Lanka to learn about an ancient healing system with some similarities to Chinese Medicine – ‘Ayurveda’. Interestingly, Sri Lanka is home to what is believed to be the world’s oldest hospital (3rd Century BCE), so it seemed like a pretty good place to discover an ancient medicine system. ‘Ayuervda’ is roughly translated as the science of life. It is the predominant traditional healing system of the Indian subcontinent. Sri Lankan Ayurvedic medicine differs somewhat from Indian Ayurveda particularly in relation to herbal medicine which takes on a local variation. Ayurveda, like Chinese Medicine, involves supporting the body to attain balance. There are also Five Elements that are fundamental to this system however they are not exactly the same as those in Chinese Medicine. According to Ayurveda, there are three basic diagnostic types (dosha) based on their Five Elements: pitta, kapha and vata. Find out your dosha by doing this quiz. My trip took me to the Dalmanuta Gardens Ayurveda Resort and Restaurant, a peaceful oasis on the Bentota River. Most people attend Dalmanuta Gardens to learn about Ayurvedic principles to improve their health and/or to correct imbalances in the body; some patients are long term guests with serious health concerns. Patients are treated through a regime of yoga, specific dietary considerations (food cooked to balance out your ‘type’) and a range of herbal and bodywork treatments. Each patient has their treatment plan guided by an Ayurvedic doctor; in my case, Dr Vimukthi. Body palpation and pulse diagnosis form a major part of forming a diagnosis, in addition to questioning. I cannot speak more highly of my two Ayuredic therapists who carried out the prescribed treatments: Gayan Sameera Samaranayaka and Jeewani Champika. Sameera was a master of deep tissue massage and Jeewani gave the most soothing shirodhara treatment. Both were extremely professional and happy to teach me about their medicine. Breakfast (cooked for your type) served in a little hut on the Bentota River. It included a green herbal soup which looked ‘interesting’ but was actually quite tasty. Lunch (cooked for your type, again served in the river hut while you are still in your treatment robe soaking in the good oils and herbs. Relaxation after lunch (it’s a nice opportunity to explore the magnificent ayurvedic herbal garden or sit in the meditation garden. Dinner – here you have the opportunity to join the chef to learn how he cooks the foods that have been prescribed for your dinner. I had a one-on-one session and learnt to make several Sri Lankan curries from scratch (including with milk straight out of the coconut) and coconut sambool. The fresh ingredients are mostly grown organically on the property. Once again dinner is served in the river hut where you can hear the aquatic life swimming below, nocturnal animals moving around on the opposite river bank and prayers from the nearby mosque. Bedtime. I probably don’t need to point out that I slept very, very well here. I left Dalmanuta Gardens far the wiser (although certainly no expert) about Ayurvedic medicine, treatments and dietary medicine as well as having glowing skin and a hard, old, hip injury that was feeling a lot more supple. 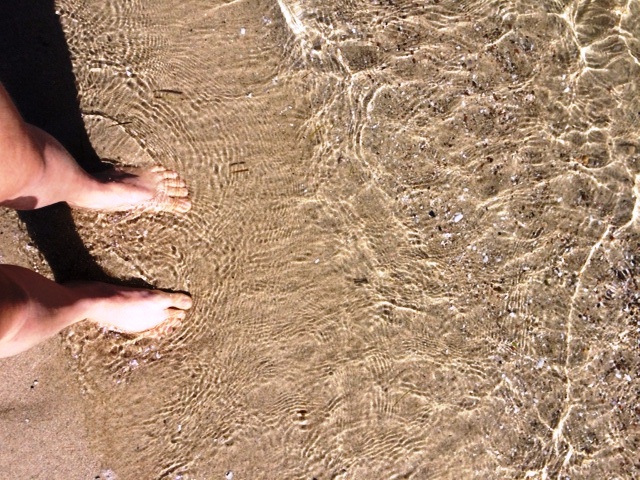 There’s nothing like dipping your toes in to the ocean. I escaped from Brisbane this week just gone and thoroughly enjoyed a refreshing break. I’ve written several times about why taking a break is important, how I like to relax and why the great outdoors is good for us. 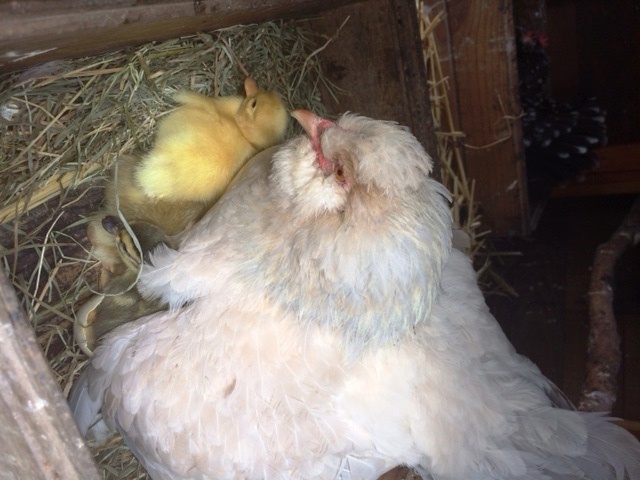 Ducks aren’t very clucky so this hen was happy to lend her services. This couple are interested in sustainable living. In addition to the ducks, they have a very impressive veggie garden which is helped along by rotating their chooks around the beds. Further down the backyard are the horses. Meals always include a good helping of fresh veggies from the garden. Oh! 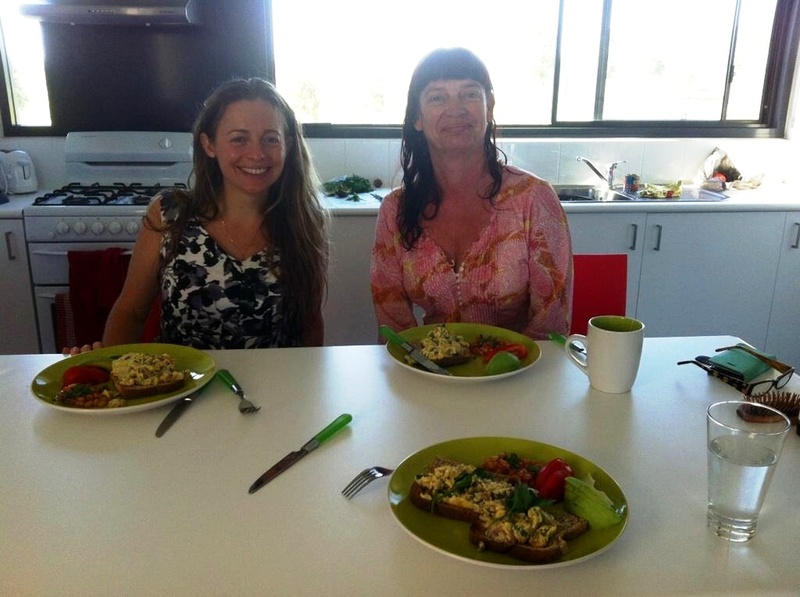 And I also tried my first duck egg – scrambled with fresh herbs. 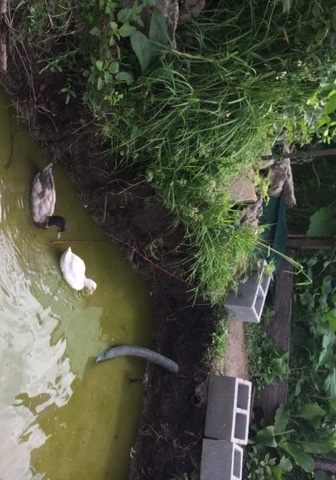 The duck pond with just the edge of the veggie garden in the background. 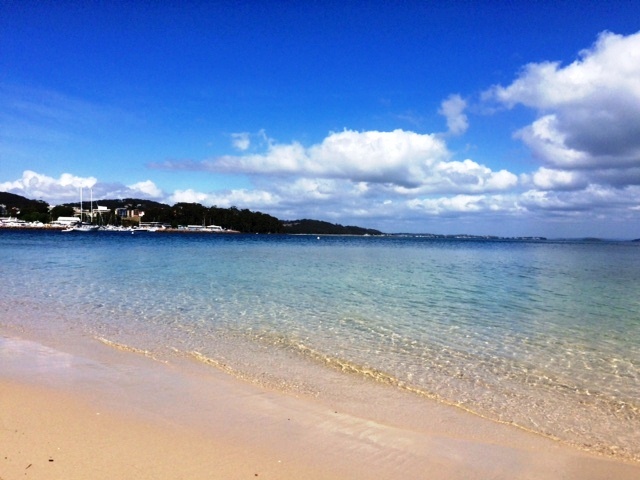 My next stop was Nelson Bay in Port Stephens. This place is a sleepy little coastal town. My drawcard was that I had read that the scuba diving was up there with some of the best that New South Wales has to offer. We headed out on the boat to Broughton Island. This was my first dive in a while and I was lucky enough to see a Grey Nurse shark at around 2.5-3m. She was a biggie! I also met some lovely new friends on the boat. I’ll be back to Nelson Bay for some shore diving sometime, it is supposed to be spectacular! I’m back in the clinic this Thursday and Friday. I’m a bit slow on getting my spring living post out this year! Apologies to all of you who have been wondering what to do since the turn of the season, you can now relax with the information contained within this post. Here’s a little song to get you out of winter and into the spring mood. Moving from the cold and slowness of winter into a warmer, more energetic state as our Yang Qi predominates. There is an upward energy. The mood picks up, life feels lighter. And there is a need to move more and get active. We need to stretch out and get flexible after the rigidity of winter. Plants are sprouting fresh green shoots. This is the time of the Wood element and the Liver and Gallbladder need care. The wind picks up. This has been particularly noticeable in Brisbane in the afternoons especially earlier in the season. There is more light and longer days giving us a good supply of vitamin D to support our yang Qi. Safe levels of sun exposure depend on where you live and are outlined here. The colour is green in keeping with those fresh sprouts. The flavour is sour which again brings a feeling of lightness and freshness. 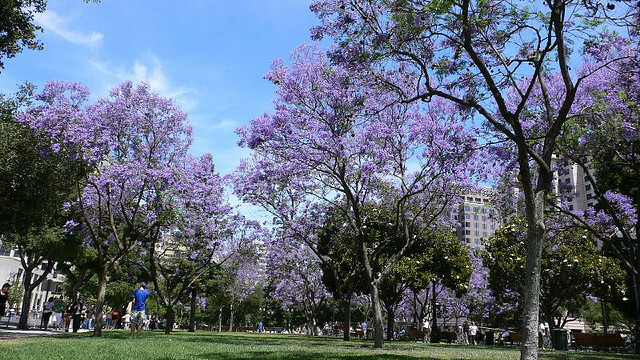 Spring is a wonderful time to walk around the Jacaranda trees in blossom. Get some outdoor exercise (eg. walking or qi gong) and sunlight in the morning before you start the serious stuff in your day. Wear loose clothing and don’t tie your hair back tightly. Let everything flow. Focus on relaxation and flexibility of your mind and body. Now is an excellent time to get into some meditation and/or yoga. Sing, dance or do activities that lighten your mood. Work within your limits so as to enjoy the movement and longer days but not to overtire yourself. Be prepared for changes in the weather, so while most of your summer clothes are coming out, have a spare layer handy to protect yourself from a sneaky cold snap or some breezy conditions. Do a spring clean. Get rid of the clutter and excess that might have been stored away during winter (or the rest of the year). A spring clean can be in your house, body and/or mind. Make room for the new. Open the windows. Get good ventilation in your space. Get some indoor plants. Focus your attention to being positive, optimistic, open minded, tranquil, happy and friendly. Enjoy nature. Go hiking, camping or anything you enjoy that takes you into the great outdoors. liver through some sour foods – just enough to make you feel well but no need to over do it. A squeeze of lemon in your water or some natural yogurt can be beneficial. wood element through green coloured foods eg. green tea, green leafy vegetables (kale, broccolini, baby spinach), peas, beans, asparagus, sprouts and celery. Avoid very spicy and fatty foods at this time of year and don’t overdo the sour flavour. For another post about spring health read here. Happy International Day of… Happiness! Yes, the United Nations proclaimed that 20th March is the day to officially recognise that Gross National Happiness is just as important in creating policy as Gross National Product. Today I thought it was fitting to share two videos with you. The first an entertaining and warm take on compassion and interconnectedness with others to our well being. These are ideas we can all include in our daily lives – starting right now. Robert Thurman, the first American to be ordained a Tibetan Monk by the Dalai Lama, gives us this short little gem of a TED talk. Secondly, if you want something more light hearted which will put a smile on your face right now, well you can’t go past Monty Python’s Always look on the bright side of life. It actually reinforces one of Robert Thurman’s points that even in times of suffering making the effort to smile is more beneficial to you than the alternative. The happiness web: how to get in it. These are my favourite happiness resource websites. How to stress less: create happy habits. My tips for happiness including a one minute meditation video. Tea and happiness. Well just that really. I hope you enjoy today’s happiness offerings. And while we are chatting about happiness, why not drop me a comment about what contributes to your happiness? 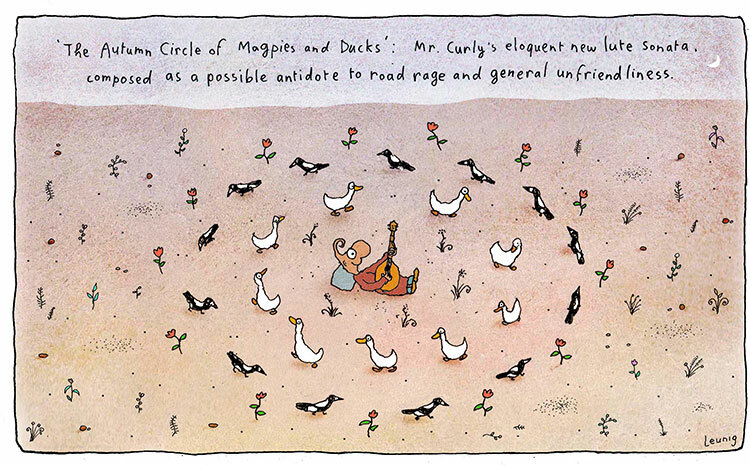 From the cartoon genius that is Michael Leunig. I thought this was incredibly cute. Many people say that autumn is one of the most delightful times of year in Brisbane with beautiful clear skies and moderate temperatures. Autumn is the time when the heat and humidity from summer dissipates gradually and we begin to dry off and cool down in the transition towards winter. Here’s something to put you in the mood: Tchaikovsky’s Autumn (or October in the northern hemisphere) – the inspiration for Leunig’s ‘The Autumn Circle of Magpies and Ducks’ perhaps? Get more sleep. Go to bed earlier than in summer and rise a little later. Don’t tire yourself out physically or sweat too much. Feel the weather getting cooler but don’t feel the need to rug up to be ‘over’ warm until the weather gets colder. Layers are good! On the other hand, be prepared with some warm clothes and bedclothes in the case of a cold snap. Exercise should be more about building strength than sweating it out in the autumn. This relates to gathering muscle and preserving body fluids. However, if you wish to lose weight, Chinese medicine considers autumn a good time to exercise more to prevent further ‘storage’ over the winter. Look after your skin. Find yourself lovely aromatic, natural facial and body moisturisers/oils to keep your skin nourished in the drier climate. Don’t forget to moisturise after a bath too. This is also an excellent time to pull out some books, cards and board games for a little bit of inside time with friends and family in the evenings. If you love summer then autumn can be a sad time. Make the most of bright and crisp autumn days, getting some safe exposure to sunlight. This could involve a walk in nature, exercise in a park, and sightseeing around mountains, rivers or lakes. More substantial meals than in summer, yet not as heavy as in winter – simple and sumptuous! Savour the deep, complex flavours of autumn. Moisten dryness with foods such as pears, spinach, nuts, seeds, avocado, milks (if they agree with you, including soy) and honey. Porridge with honey and banana can be very moistening. Eat some pungent and warm foods (Eg. leeks, radishes, garlic, cinnamon, ginger, onion and chilli) but not until you sweat. Also gradually include sour (preserve fluids) and bitter (descends to store) flavoured foods. Make the most of: wild mushrooms, garlic, leeks, onions, potatoes, turnips, parsnips, swedes, beetroot, broccoli and borlotti beans. A lot of these foods are naturally white in colour which is synonymous with the metal element. Avoid excessive cool/cold/icy foods and drinks. Use cooking methods which will maximise food aromas such as baking (warming) and saute (preserving moisture content). Use your slow cooker to gently warm and keep the moisture in your food – plus you will come to the aroma of a home cooked dinner! If you find that autumn brings out the worst in your health (eg. moodwise, asthma or respiratory symptoms, skin conditions, constipation or other digestive orders) talk to me about acupuncture, herbal medicine or other lifestyle methods which may benefit your condition. I’ve made this several times and this is the best photo I have so it’ll just have to do! A great friend who I have not seen in a very long time texted me yesterday and said she had a dream where the two of us found a secret stash of chocolate. Ah! The perfect dream. So here’s the recipe. It’s not dairy-free if you use the small amount of white chocolate – so vary the types of chocolate as you wish. The white chocolate just makes it look pretty but definitely is not essential. And, good quality dark chocolate has quite a few health benefits when eaten in moderation. Line a heart-shaped tin (or whatever shape you’d prefer – about 15-20cm²) with plastic wrap. Make sure to have as few creases in the wrap as is possible. Melt dark chocolate (70% +) in a heat-proof bowl over a saucepan of gently steaming water. (Make sure that the water does not touch the bottom of the bowl). 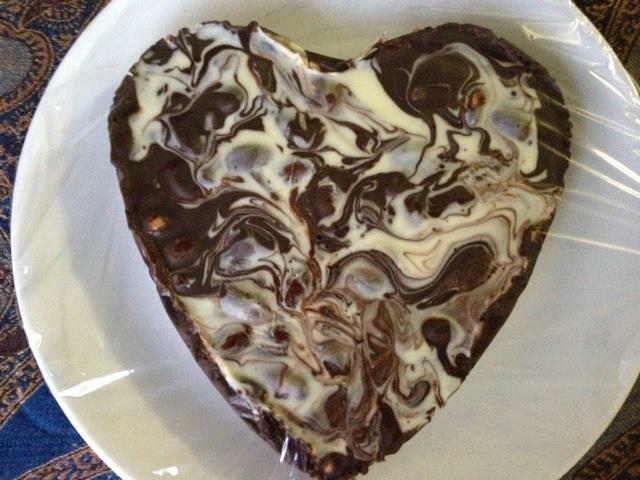 When melted, mix fruit and nuts into the dark chocolate. Pour chocolate mix into the prepared tin. In another bowl, melt the white chocolate. When melted, spoon the white chocolate on top of dark chocolate in the tin and muddle it with a skewer to create a marbled effect. Refrigerate for an hour or so until set. Peel the plastic wrap away to serve. You will end up with a thick block of fruit and nut chocolate. Serve it on a wooden board with a blunt knife to break it up. And as a side note, if you are struggling with a real broken heart you might like to read this.